The Happy Hawks campaign is coming back to Wilfrid Laurier University’s campus at the end of the month to bring students a little bit of cheer amidst exam season. The campaign — which was originally launched last year for spring exams — aims to engage and connect the Laurier community. Laurier alumni and community members are being given the opportunity to write out messages of encouragement, comfort or advice, which are then passed out to students around campus. This term, Happy Hawks is set to take place on Dec. 6, the first study day allocated for the fall term exam period. “My hope is that we can provide alumni with the opportunity to reflect and reconnect,” said Danielle Braun, alumni officer at Laurier and creator of the Happy Hawk initiative. In addition to the motivational and comforting messages, Happy Hawk gives students free coffee and snacks, which are provided by the initiative’s sponsors such as Awake Chocolate, as well as campus partners like Veritas, Laurier Food Services and Wilf’s. “We provide alumni the space to write out their social media handles, so if students want to and are comfortable doing it [they] can then take a photo of the message or quote they received and then write back to the alumni and say thanks, so that we’re building those connections and the engagement,” Braun said. 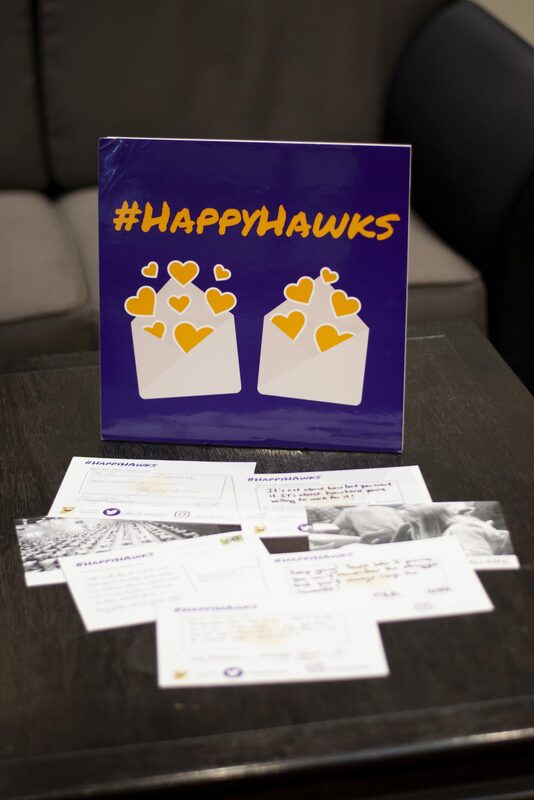 To gear up for the campaign — which will be taking place on Dec. 6 — Braun and her colleagues have encouraged alumni to fill out a Happy Hawk postcard. In specific, Alumni have been writing messages for the campaign at various Laurier Alumni events that have taken place throughout the last several months. “It’s been really well received because they can think back and put themselves in the shoes of students while getting them to fill out the cards,” Braun said. Alumni and community members are also able to submit messages online or on social media by using the hashtag #HappyHawks. “My colleagues and I will write those messages out by hand onto these cards so that we’re handing them out to students along with coffee and chocolate and other treats that are donated to the campaign,” Braun said. Not only does the campaign allow alumni to reflect on their time at Laurier and give the advice they wish they had heard during stressful times like exams, it also provides an opportunity for engagement. Happy Hawks is a multi-campus initiative and will be taking place at Laurier’s Waterloo, Brantford and Toronto campuses.